Welcome to the homepage of the Research Institute for Linguistics of the Hungarian Academy of Sciences. By unifying excellence in research, authenticity in science and a commitment to society, the institute network of the Academy is set to produce scientific results of value to Hungary and the rest of the world. As part of the only full-time research institute network in Hungary, with nationally well established research traditions, our primary aim is to play a fundamental role in promoting the good of the general public and in building the foundation for our future through valuable scientific achievements based on highly promising and innovative research. 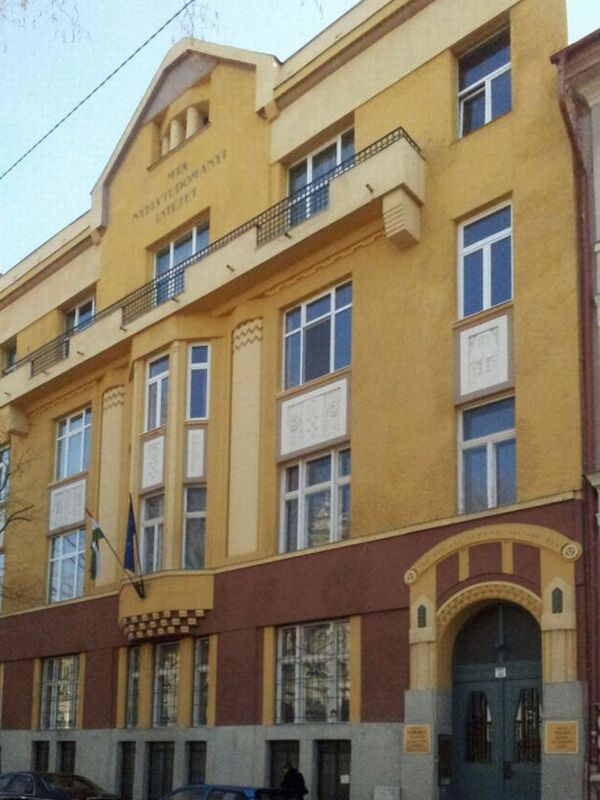 The primary tasks of the Research Institute for Linguistics of the Hungarian Academy of Sciences include theoretical and applied research in general linguistic issues, as well as in Hungarian linguistics, Uralic studies, and phonetics. We also undertake the on-going compilation of the comprehensive dictionary of Hungarian. Other projects investigate different variants of Hungarian and minority languages in Hungary, as well as issues in language policy. Further tasks include the assembly of linguistic corpora and databases. The Institute operates a public counselling service and prepares expert reports on relevant affairs on demand. The Institute also runs the Theoretical Linguistics Programme jointly with Eötvös Loránd University. Documentation concerning the legal status of HAS' Research Institute for Linguistics can be found here. With the completion of the general overhaul of its building, the Research Institute for Linguistics is now moving back to its regular place, 33 Benczúr utca, and continues to operate there from June 28. The library is due to open again for the public in early September. Dr. DU Xiang lexicographer (Chinese Academy of Sciences (CASS), Institute of Linguistics) will be a visitor professor in the institute for 12 months from the end of October. Rebecca Woods (University of Huddersfield) will be a visitor of the project The grammar and pragmatics of interrogatives and their (special) uses between 13 and 17 November 2017. Maria Polinsky (University of Maryland) will spend 4 months at the Research Institute for Linguistics as one of the winners of the Distinguished Guest Scientist Program of the Hungarian Academy of Sciences. The Research Institute for Linguistics celebrated István Kenesei, retiring director, on his 70th birthday. From 2017, Acta Linguistica Hungarica is being published with a new title: Acta Linguistica Academica. Volume 64, issue 1, the first issue to bear the new title, is available open access from the publisher's homepage. This issue contains articles by Marcel den Dikken, Anikó Lipták and István Kenesei, Gregory Stump, Akira Watanabe and Jeroen van de Weijer. The Hungarian Academy of Sciences (MTA) calls for applications to gain premium post-doctoral researcher status in MTA's research network and Hungarian universities. Jonathan Bobaljik (University of Connecticut) and Gillian Ramchand (University of Tromso the Arctic University of Norway) will both hold a lecture series at RIL during the week of January 20-24, 2017, co-organized by the Budapest Research Centre for Linguistic Theory (ELTE) and RIL. The course by Jonathan Bobaljik is financially supported by the Linguistics in Education and Research Foundation (Nyelvészet az Oktatásban és a Kutatásban Alapítvány); the course by Gillian Ramchand is made possible by the Tempus Public Foundation (EEA Financial Mechanism 2009-2014, HU08 Scholarship Programme, EGT/156/M2-0004). Hungary joins CLARIN ERIC: On 1st August Hungary gained admission to CLARIN ERIC, the European Research infrastructure whose mission is to bring modern language technology tools and resources to researchers in the Humanities and Social Sciences and provide support in their use. The Research Institute for Linguistics was a founding member of the CLARIN project that was launched after the first ESFRI Roadmap and played a leading role in the preparatory phase of the project. Until now lack of national support prevented it from joining CLARIN ERIC, which was formed as CLARIN entered its construction phase. The Research institute for Linguistics acts as the National Coordinator of the HUNCLARIN research infrastructure network, which currently has seven members. Membership in the 19 country strong CLARIN ERIC will open up new vistas for collaboration and will enhance the quality and visibility of Hungarian research in the Humanities and the Social Sciences. Markus Wilhelm Steinbach (Georg-August-Universität Göttingen) will spend 3 months at the Research Institute for Linguistics as one of the winners of the Distinguished Guest Scientist Program of the Hungarian Academy of Sciences. The 85th birthday of Ferenc Kiefer, member of the Hungarian Academy of Sciences and former director of the Research Institute for Linguistics, was celebrated on May 24th in the company of a number of invited guests. He was presented with the single copy of an album, specially produced for the occasion and containing memories or greetings, several of them hand-written, and contributed by his friends, colleagues, and former students. After the short celebration, Ferenc Kiefer shared his professional plans for the future with the audience. The Amsterdam conference on 'Open Science – From Vision to Action' resulted in the Amsterdam Call for Action on Open Science. This call for action formulates pan-European goals concerning the open access of scientific publications and the reuse of research data. It also includes twelve action items with concrete actions to be taken. The first four articles and editorial in Glossa, a new Open Access journal on general linguistics are available online. The National Research, Development and Innovation Office (NKFIH) has announced a call for postdoctoral research proposals (PD_16) starting between October 1 and December 31, 2016. The Hungarian Academy of Sciences announces a grant to gain premium post doctoral researcher status in MTA's research network and Hungarian universities between September 1, 2016 and August 31, 2019. With Zoltán Bánréti as co-author, a new article appeared in one of the leading journals of neurolinguistics. Glossa, a new Open Access journal dedicated to general lingustics and managed by the former editors of Lingua, is open for submissions. The Hungarian Academy of Sciences calls for applications to establish new Lendület ("Momentum") research teams starting from 2016. Two-year postdoctoral research fellowships have been granted as part of the MTA Postdoctoral Research Programme to Éva Dékány (Department of Theoretical Linguistics, supervisor: Katalin É. Kiss) and to Tilda Neuberger (Department of Phonetics, supervisor: Mária Gósy). The Research Institute of Linguistics of the Hungarian Academy of Sciences (HAS) invited Professor Hu Jianhua, and Professor Li Aijun from the Institute of Language, Chinese Academy of Social Sciences to spend one week in our institute in November 2014 as visiting researchers, within the cooperation framework of HAS and the Chinese Academy of Social Sciences (CASS), to participate in the research cooperation activities supported by the two Academies. New 3-year research project in RIL HAS on 'Grammar and Pragmatics' in cooperation with researchers from Bielefeld University in the framework of the Institutional Partnership Program of the Alexander von Humboldt Foundation. An edited book on Hungarian diachronic syntax entitled The Evolution of Functional Left Peripheries in Hungarian Syntax has been published by Oxford University Press. Marcel den Dikken, who is Professor of Linguistics at the City University of New York, started his research project at the Research Institute for Linguistics on 1 September, 2014. Professor den Dikken is one of the Distinguished Guest Scientists of the Hungarian Academy of Sciences for the academic year of 2014/15. He will spend 10 months at the Resarch Institute for Linguistics working on filler-gap dependencies in natural language and the way their locality is constrained. Information on the creation of the "Hungarian Language Strategy Institute"
A cooperation agreement has been concluded between our institute, and the Institute of Language of the Chinese Academy of Social Sciences (CASS), based on the general cooperation framework of the two Academies, but also expanding it, and spelling out the scientific program of the cooperation as regards linguistic research. Research Institute for Linguistics, Hungarian Academy of Sciences is a member of the Mercator Network of Language Diversity Centres, which is funded within the EU programme on LLP.